Fried fish and steamed alugbati. Whenever we're in a hurry to prepare a meal, we usually end up with fried fish and steamed vegetables. And today's vegetable is--- alugbati! Some may not even like this green leaf with purple stem but we to dip it with toyo-mansi. The sliced tomatoes are for the fish. Years ago, during WWII, my parents told me that they heard of POWs eating boiled gumamela leaves to quench their hunger. Although I can't imagine myself eating gumamela (hey! i'm not sure if there are gumamelas in the city anymore? ), I can stuff myself with alugbati, saluyot, and other greens. And if bagoong is available, these steamed veggies tastes wonderful! 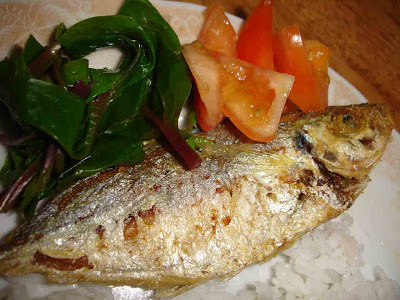 Fish on the photo is called Salay.